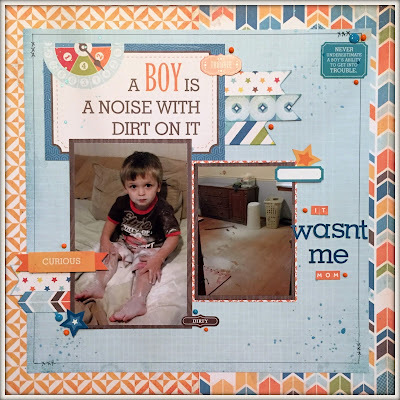 Time for another layout – I’m on a roll this week! 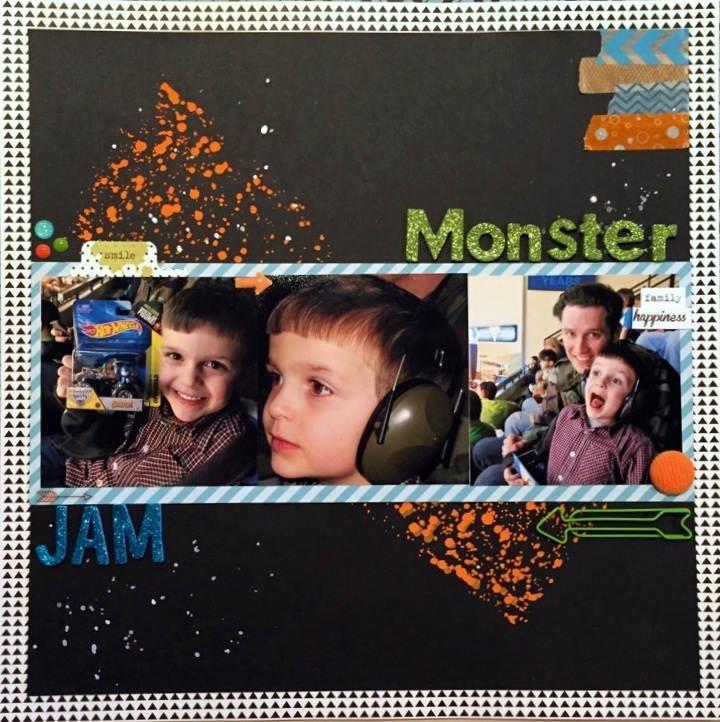 I can’t believe how quickly this one came together using the sketch from ScrapMuch? Seriously…it was done in under 20 minutes, and I’m usually one that agonizes over where I place everything. The collection I used was Be Different by Fancy Pants. It was perfect for the sketch and the subject of my photos. This was our son, and my nephew, at my aunts surprise wedding last June. She told us it was a retirement party, but some of us guessed better 🙂 The journalling is hidden on the tab that says cousins…pull it up and voila! Filed Under: Fancy Pants, layout ideas, layouts, lynnseverydayideas, pearl pens, scrapbooking, ScrapMuch? I’ve been a busy girl this month! I don’t really ever get a page done this quickly, but I was looking for something to work on yesterday and the sketch at Let’s Capture our Memories was just perfect. When I saw it I new exactly what pictures I wanted to use, but I wasn’t sure about paper, and usually it take me forever to decide. This one…I pulled out my Echo Park All About A Boy Scraps and it was done in less than an hour. I really should have filmed a video it was so fast. 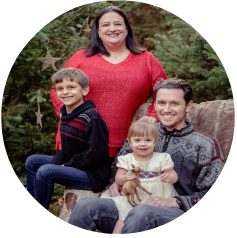 Since I didn’t get my journalling on yet I can tell you that one Sunday my hubby was at church already since he was playing for service…I had gotten M ready and turned on a show so I could get in the shower. When I came out the entire container of baby powder was EVERYWHERE! I really had to laugh because my little sister did the same thing when when she was about the same age. So I’ve had my eye on the creative kit from My Creative Scrapbook for a couple months now. Last week they had a promotion that if you signed up you received a free Julie Nutting doll stamp and prize pack. Well that was enough that it tipped me over the edge. What I really liked was you could sign up for two months as a trial. I have signed up previously for kits that require a six month commitment and after two months of lousy kits realized I was stuck. I like have the chance to try these first. My first kit came yesterday, and I dove right in. I will have an open box going on on you tube shortly if you want to see what all was in the kit. It was jammed packed of things that matched! That was my frustration with a previous kit club…you got bits and pieces from this and that collection/designer and nothing really matched anything else. This could all be used together. The kit also came with a copy of the monthly sketch from their blog called My Creative Sketches, which is what I used for the layout below. The paper is from the kit and is part of the Bella Blvd Color Chaos collection. The orange dots are modeling paste mixed with pearl pen and put through a Tim Holtz stencil. 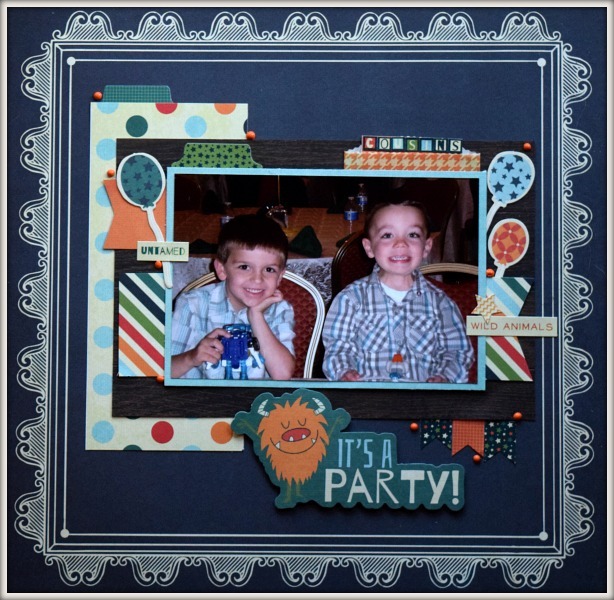 The embellishments come from various companies including Freckled Fawn, Doodlebug, Queen & Co and Stampin’ Up. I don’t usually work on black, but I’m trying to get out of my comfort zone. It will definitely take some getting used to. How do you think it came out? Until next time…Keep Scrapping! Hey Everyone – I’m back two days in a row! 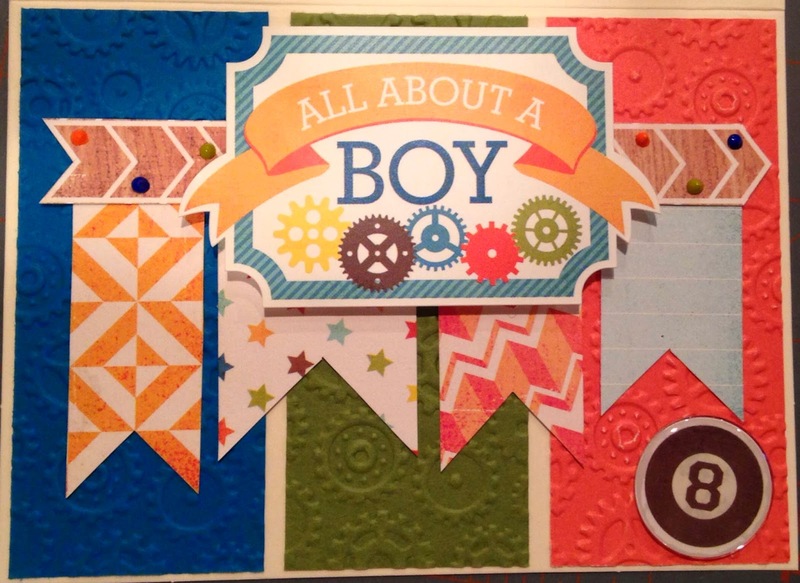 This morning my father and I were taking my son somewhere special so I didn’t have to leave as early as normal, and I decided to make a quick card for the Sketch~n~Scarp card challenge, the Sister Act Card Challenge “Anything Goes”, and the Craft Your Passion Boys challenge. 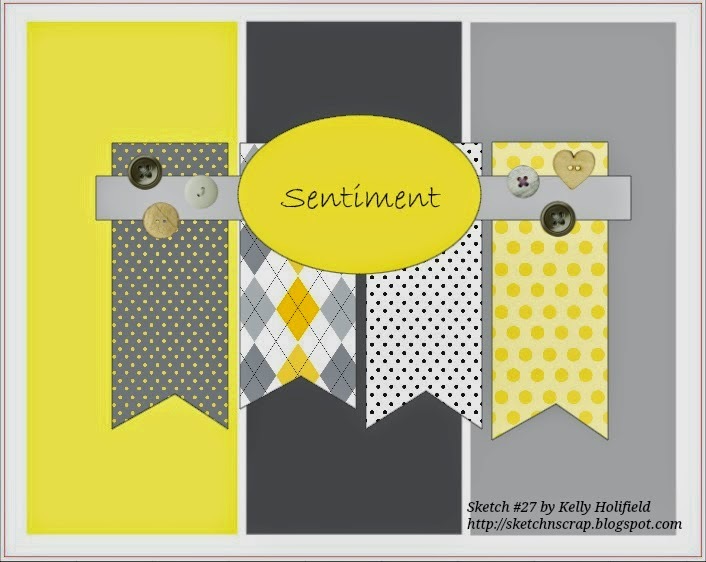 Can you tell I love the Sketch~N~Scrap sketches – they always challenge me to use what I have! 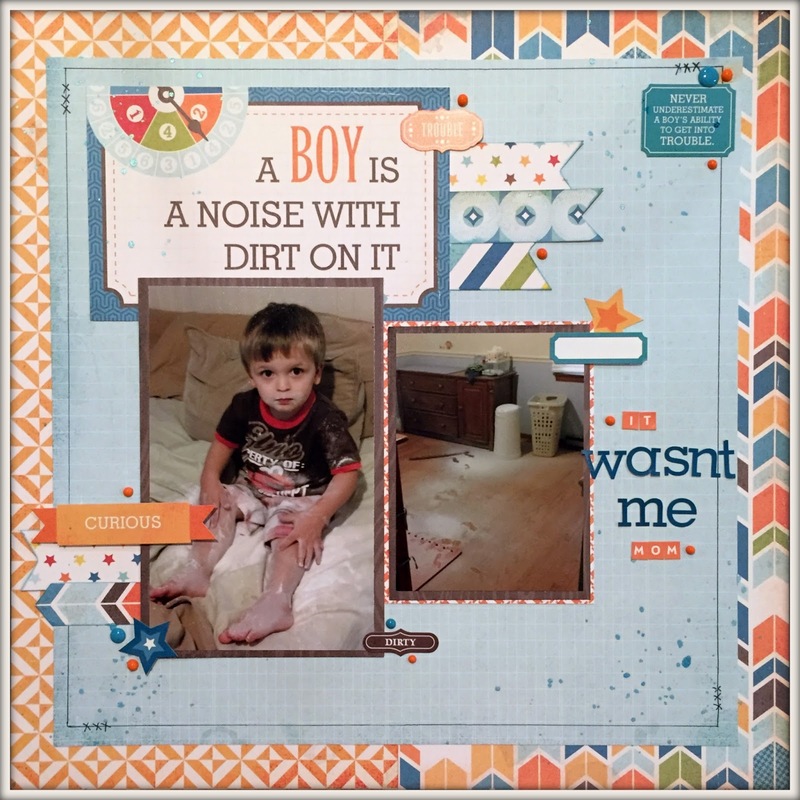 I used one of my favorite collections from Echo Park – All Abut A Boy. I cut the banners and arrow by hand, and then used an embossing folder for the background. The dots are pearl pens…another favorite product of mine. I’ve been on such a roll lately that I’m wondering when the mojo is going to end 🙂 Until next time – keep scrapping!